Will the RBA Play the Intervention Game? Currency intervention has been a hot topic in the foreign exchange market for the past few months. The Bank of Japan (BOJ) has done it, the Swiss National Bank (SNB) has done it, and now, word on the street is that the Reserve Bank of Australia (RBA) is also interested in doing it as well. In a recent speech, RBA Governor Glenn Stevens said that the strength of the Aussie is quite “odd.” While he didn’t explicitly say that this “oddness” was a good or bad thing, he seemed to suggest that the RBA has been feeling uncomfortable with the current exchange rates. He even added that even though the central bank hasn’t tried to hold the Aussie’s value down like the SNB has done for the Swiss franc, it isn’t ruling out that possibility. Why would he be concerned anyway? 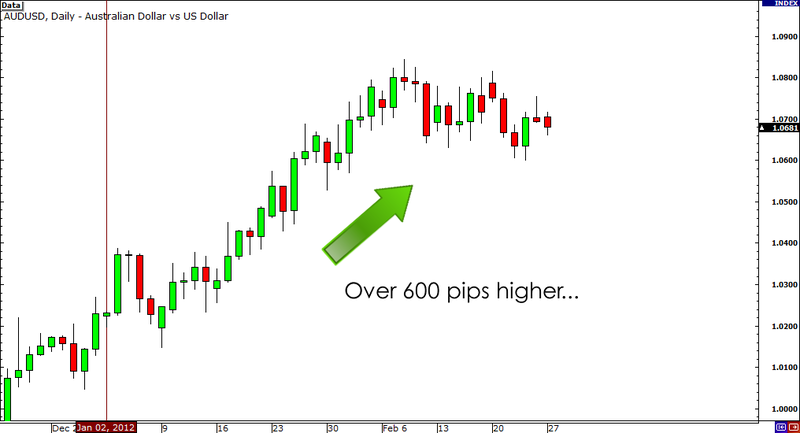 A look at the AUD/USD chart will reveal that the pair has surged over 600 pips from last December’s levels – that’s an almost 7% gain in under three months! Stevens and his boys would like the Aussie to stabilize, if not weaken, for the same reason that the BOJ and the SNB intervene in the markets – to protect exports. Its recent rally is coming at a very critical and inconvenient time in that Australia’s trade has just peaked and is starting to turn down. The Aussie poses a very real threat to trade-exposed industries, such as manufacturing and tourism. I visited Australia recently and I was surprised to find how expensive things have become for tourists! I just don’t get the same bang for my foreign buck in Australia these days. Even though he opened the doors to intervention talks, it doesn’t seem like the Governor is completely sold on the idea. In fact, he doesn’t think it’ll be an effective strategy, citing the heavy intervention by the SNB a couple years ago as an example. If you don’t remember it, let me remind you: it was a total flop! Back in March 2009, when EUR/CHF was flirting with 1.4600, the SNB intervened and sent the pair up 500 pips in one day. But it only stalled the franc’s climb temporarily, because the pair spent the next year or so chipping away at its gains. They were unsuccessful in stopping the franc from rising, and as a matter of fact, EUR/CHF hasn’t seen those levels since then. Keep in mind though that the central bank’s strategy in 2009 should not be confused with what it’s employing now, as its current franc-euro peg seems to be doing a decent good job at keeping franc bulls at bay. All in all, I feel that it’s highly unlikely that the RBA will act on weakening the Aussie dollar in the near term. It will probably take at least a couple more months (even quarters) of stellar gains before the RBA seriously considers going the same path as the BOJ and the SNB. From the tone of Glenn Steven’s voice, it’s clear to see that the central bank isn’t ready to intervene, and this may serve as a green light for Aussie bulls to keep buying. Will the Aussie drive the RBA to intervene?